Ward 53 Councillor Bongani Qhantsi, expressed his gratitude on behalf of the Amaoti community saying that he hoped that The Domino Foundation would continue extending a helping hand to the needy. This was after the recent disastrous thunderstorm hit the township areas of Durban North, unleashing devastating flooding in areas close to the riverine. Many families lost their homes and almost all their belongings. 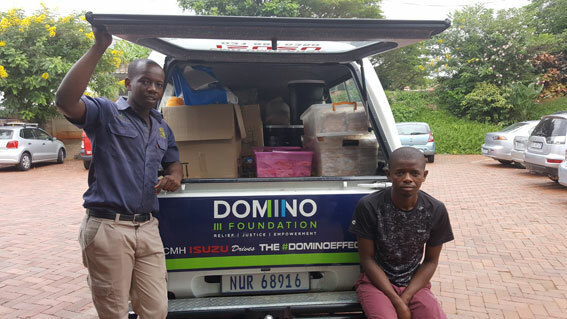 The Domino Foundation’s Feeding programme, which has worked in the area for a number of years, supplying sandwiches and soups to several school’s in the area on a daily basis, extended their hand of help. The programme dispatched relief buckets, bottled water, cases of chicken, eggs, powdered milk as well as clothing to the victims’ families.